How come the deadlift strength standards are so much higher than squats? I find deadlifts so much harder! I've finally got it equal to my squat and now I see that it's miles off in the exrx strength standards table whereas my squat is advanced. Also, bench press looks a lot easier to hit. I'm incline pressing the advanced for reps. Anyone else find the numbers weird or am I just an oddball? I've not checked those for ages - i'm pleasantly surprised. Advanced on Squat, Bench, Deadlift, and Press. I'm gunning for Elite on Deadlift! Although, I doubt I could pause 125KG on bench right now. Touch and Go isn't a problem, though. It can just be your leverages. At my comp, there were guys squatting 40-50 KG more than me, and I would Deadlift 10-30KG more than them. Although, there is about 60KG between my squat and deadlift.... In the comp there was 70KG of a difference. However, i'm losing out on, I reckon, 20-ish KG on my squat on technique alone. Nevage wrote: How come the deadlift strength standards are so much higher than squats? I find deadlifts so much harder! I've finally got it equal to my squat and now I see that it's miles off in the exrx strength standards table whereas my squat is advanced. Also, bench press looks a lot easier to hit. I'm incline pressing the advanced for reps. The majority of individuals can deadlift more than they squat. 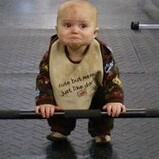 Some individuals, such as youself, can squat more or as much as they deadlift. Thus, you an exception to the rule. Hmmm interesting. I didn't take the pause into consideration on Bench Press either which would make it a lot harder. I think my leverages are odd. My Deadlift isn't too far off a squat, a lot of lower body involvement. I think I have long legs, a short torso and quite short arms. Sumo works the best by far for me. How long are your arms and legs relative to your torso? Lamar Gant had freakishly long arms and set a record that stands to this day in terms of multiples of body weight. Longer arms favor deadlift generally, shorter arms and legs favor squat and bench. He also has a very short torso, which helps with deadlifts. I'm "Advanced" for Squat, Deadlift, Bench Press and Military Press. It's only my low bodyweight that's keeping me in the advanced for a couple. My bones must weigh nothing, no one believes me when I say how much I weigh. About 77kg at the moment but I'll be 75kg by the end of this no carb week easily, with no strength being affected. Nevage wrote: It's only my low bodyweight that's keeping me in the advanced for a couple. My bones must weigh nothing, no one believes me when I say how much I weigh. About 77kg at the moment but I'll be 75kg by the end of this no carb week easily, with no strength being affected. yeah I'm the same, when I was at my skinniest even though I was very skinny people used to flat out call me a liar. I had to get on the scales more than once to prove I really was so light. I'll wait til I get home tonight and check the old training books and how things progressed. I don't do cleans or snatches, but I'm pretty good at high pulls.